Nuclear power plants are designed to withstand natural disasters like earthquakes. In France, for instance, nuclear plants are designed to withstand an earthquake twice as strong as that experienced in the past 1,000 years. In India, the Kakrapar Atomic Power Station, Rajasthan Atomic Power Station, Tarapur Atomic Power Station and Narora Atomic Power Station operated safely when earthquakes of lower intensity were felt. The plants, however, could not withstand tsunami. The campus of Kalpakkam Atomic Reprocessing Plant was flooded when tsunami hit Tamil Nadu's coast in 2004. In India, every region falls in seismic zone in some way, said Durgesh Rai of IIT Kanpur. “Most of our nuclear plants are in weak seismic zones but lie in coastal areas. Their structure is earthquake-resistant but they have not been tested against tsunami. The entire coastal region is believed to be vulnerable to tsunami,” he said. Nuclear plants are built near the sea because sea water is required to cool the reactor. The power plant survived the earthquake and was shut down. Limits are set on the levels of velocity, acceleration and displacement in every power plant. The plant stopped functioning when the limits exceeded. Atomic reaction thus stopped. When the plant stopped functioning, sea water used to cool the reactor stopped flowing. The diesel generators that were to feed water to the power plant also apparently shut down. Thus, the cores began to heat up. Though the fission of radioactive elements was stopped, some reactions continued generating a great deal of heat. Without cooling, the temperature rose, boiling off the remaining water and increasing pressure leading to explosion. In 1995, the Kobe-Osaka earthquake did not affect the nuclear power plant just 110 km from Kobe. After the 7.2 magnitude earthquake, a panel was set up to review the safety of nuclear facilities in Japan and design guidelines for their construction. The Japanese Nuclear Safety Commission (NSC) approved the panel's report. After recalculating the seismic design criteria required for a nuclear power plant to survive near the epicentre of an earthquake of high intensity, the NSC concluded that under current guidelines the plant could survive a 7.75 magnitude quake. Earthquake-prone regions are categorised between Zones I and IX from least earthquake prone to most earthquake prone. 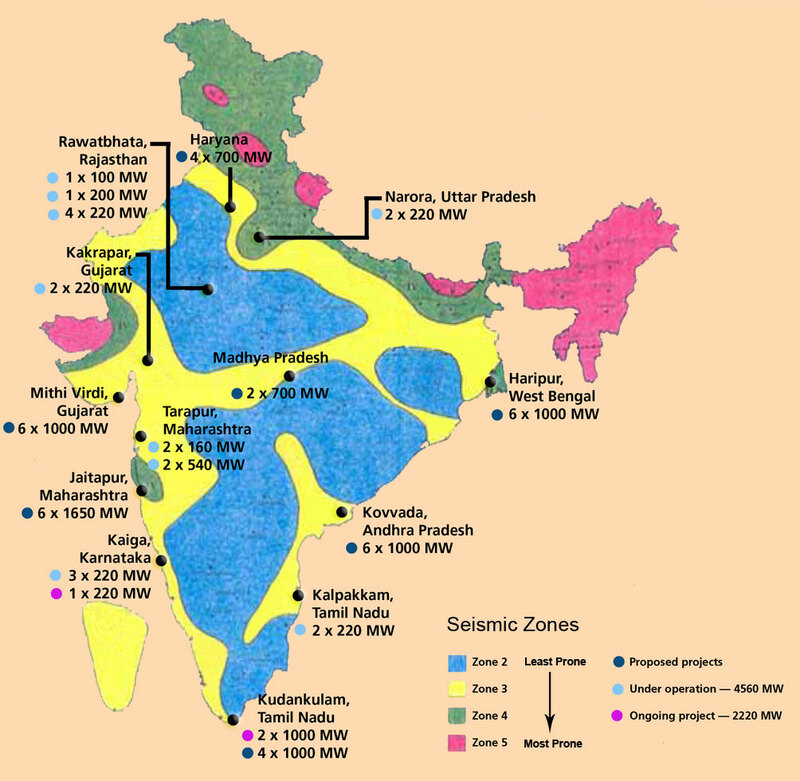 Indian nuclear power plants are situated in Zone II and III except Narora plant in Uttar Pradesh, which is situated in Zone IV. Japan’s nuclear plants are in Zones VII, VIII and IX. In the 2004 Tsunami, not only did the Kalpakkam campus get flooded,50 people on the Kalpakkam campus lost their lives in the tsunami. The fact that the NPC and AERB could not deduce that an earthquake of M 9.1 at Aceh Bay would cause a Tsunami at Kalpakkam speaks volumes of their capabilities. Madras has experienced Tsunami in 1883 after the Kakatoa volcano explosion in Indonesia and the west coast in 1945. Another shocking issue of the Madras Atomic Power Station (MAPS)at Kalpakkam is that the outer containment wall of reactor which is of 34m height is made of random rubble masonry. This would not have been allowed in any part of world. It is dangerous and one can be assured that it will undergo major damage if not collapse in even a minor earthquake shaking. Madras is in region of moderate seismic hazard. For those of us who have seen some of the engineering practices of NPC (and not just the seismic part of it), I can only say it does not inspire confidence. your information on fukushima plant disaster is partially incorrect.Shutdown cooling system is supposed to be operated by emergency diesel genarator in an accident condition.But here Tsunami disabled these genarators .Here you have to remember that this Reactor is of 1971 version BWR.Plant Safe Grade elevation considering 30 FT TSUNAMI was not envisaged by the designers at that time with the calculation methods and prediction technique available to scientific community in 1960-1965.Today Tsunami estimation world wide is highly methodical,lot of work in Round Robin manner is going on including INDIA.Before publication of the final result (BARC is leading INdian part)the maximum height was estimated in eastern & southern coast as 5.0m due to Sunda trench.similarly I heard 3.5 m on western coast due to Makran trench. Secondly, Recent Tsunami of Sumatra,did not do any damage in MAPS ,pumps remain functional for normal mode of shut down cooling.Yes township area tsunami water entered in some quarters situated on the brachfront. The root of the problem lies in Private sector controlling the Nuke power generation as in Japan.In India it is controlled by Government of India and though they may not be transparent, but the government bureaucracy always errs on the side of caution because it uses the tax payers money while private sector has to answer its shareholders.The BP oil spill in Mexico also shows how the "saving money for shareholders" makes a CEO to disregard safety.Even today when the Government of Japan does not KNOW what will happen, they were depending on 50 samurai technicians alone to save the whole plant.Using sea water, using helicopters shows lack of anticipation which is where India can learn. Infact India should have sent some Nuclear safety experts to study the case in Japan.The design flaw in the storage of spent fuel rods is a lesson India must learn with Tarapur still holding them without reprocessing. Humans learn from mistakes and India also must learn and go forward without fear.PHWR,LWR must be assessed carefully. Maybe Indian plants are in seismic zones II & III but what is the design of these plants based on? Is it designed to withstand shocks of this order or higher? Japan earthquake was higher than what the plants were designed for. Location of nuclear power plants in India Ã”Ã‡Ã´ Ã”Ã‡Â£Earthquake-prone regions are categorised between Zones I and IX from least earthquake prone to most earthquake proneÃ”Ã‡Ã˜ It is a factually incorrect statement. As per B.I.S. Code IS:1893(Part 1)-2002 India is divided into 4 Seismic Zones II, III, IV & V and not I to IX. However, this Ã”Ã‡Â£ZonationÃ”Ã‡Ã˜ needs further revision (higher resolution) based on emerging risks and disaster perceptions due to earthquake induced vulnerabilities. outer wall of kalpakkam atomic power station is of 24 inch thick pre-stressed concrete wall with post-tensioning technick. the random rubble masonry wall is only for architecture point of view, and nothing to do with the main structure. Dear SA - It is true that nuclear power plants design in India was not built taking the possibility of a tsunami into consideration. Government admitted this post 2004 tsunami. Most of the operational nuclear power plants in India had their designs approved before 2004 and thus have not beeen built to withstand tsunami. Dear AVS -The occurrence of the Latur earthquake in Maharashtra in 1993, whose epicenter is considered to be in seismic Zone 1, according to the then Indian seismic classification, was the reason why that zone was later clasified as zone 5. Though the nuclear power plants in India are built in zone 2,3 or 4, probability of an earthquake of greater magnitude than envisaged is always there. Updated Indian seismic zone code mentions that scenario. AERB had published a regulatory guide in 1990 that stipulated levels of tsunami heights to be considered while evaluating flood levels along the coastal locations of NPPs. The levels specified were in addition to height due to wave runup. Considering this, along east coast, the so called resulting tsunami wave height would be in the range of > 4m. The maximum tide is also assumed to occur at the same time. So, in the end, one would be looking at value of 5m more above mean sea level. From MNR's comments, this value appears to be not very much off..
One can argue that this approach is not as robust as the state of the art procedures and numerical simulations that might be used today... But, in 1990, how many of us had heard about the word 'tsunami'?.. Leave apart postulation of tsunami wave impact from a magnitude 9 event on Indian shores.. The outer containment wall in MAPS is a 34 m high random rubble masonry. There is no disputing this. My discussions with a top ex-AERB technocrat also confirms this though he feebly argued that its damage in an earthquake would not impair the reactor (thus implying that it could be damaged). Even a google map view will show the wall. It is laughable were it not tragic for someone to argue that a reactor has an external 34 m high rubble wall for "architecture" purposes. A more astute argument would have been that you do not need an outer containment wall- but if that were the case, why build it and that too of a material which is a complete no-no in a seismic zone? We could claim our rightful place in the Guiness book for having a random rubble wall as an outer containment wall for a nuclear reactor. The supporters of AEC/NPCIL are shouting hoarse in the comments above that the Tsunami of 2004 did no damage to MAPS. It shows their utter contempt for human life when they dismiss the loss of 50 lives within the Atomic power station colony as "no damage". WHat really is damage? Only when the reactor starts leaking? Only when any main plant has physical damage? By that definition there was no damage in the Bhopal gas tragedy. What did we make such a fuss about? It is time we became a more civilised society and valued the lives of every citizen of this country. I think the nuclear hawks will lose the debate if they stonewall valid queries, if they are not ready to talk to civil society logically, rationally and coherently. People have not yet made up their minds about nuclear power but these guys are pushing them fast towards doing so. They need to be more humane, less autistic if they want to appear to be working in a democratic framework. A glance on the magnitude of earthquake event, its acceleration levels and tsunami height (above 10 meters) at Fukushima NPP site, clearly indicate that this massive event was much above the design basis earthquake and tsunami (5.7 meters), for which Fukushima NPPÃ”Ã‡Ã–s structures, components, and equipment (SCE) were designed. Now, if we compare the scenario of coastal Indian NPPs, i.e., Kalpakkam, Kudankulam (two reactors of 1, 000 MWe each, under construction), and Tarapur in December during December 26, 2004 Asian Tsunami, there was no impact at Tarapur and Kudankulam (near Kanyakumari) site. At Kalpakkam, which is 80 km south of Chennai), minor damage on Madras Atomic Power Plant (MAPS-1&2) took place in the form of damage to double fencing near the pump-house, however, in the NPP township there was significant loss to life and property. Houses close to coast (approx 100 meter from the coast), suffered damage like entry of slush, breakage of compound wall, doors, window panes, erosion of approach road to bridge inside township, snapping of power, water and communication facilities. At the time of tsunami, MAPS-1 unit was under maintenance (shutdown) and MAPS-2 unit was under operation. Due to high waves, seawater level in fore bay increased above the operating floor level of pump house, which tripped the Condenser Cooling Water (CCW) pumps and Process Sea Water Pump (PSWP). Within 10 minutes the reactor of MAPS-2 unit brought down to safe shutdown condition with one PSWP operating as a precautionary measure (for details, please refer to a paper by Gupta et al, 2006 Ã”Ã‡Â£Earthquake and Tsunami Impact on Indian Peninsula: Historical Perspective and Future DirectionsÃ”Ã‡Ã˜, Proceedings of 13th Symposium in Earthquake Engineering, IIT Roorkee, December 18-20, 2006, Vol-I, pp.217-227). After the 2004 tsunami, various wings of department of atomic energy (DAE) such as Nuclear Power Corporation of India Ltd. (NPCIL), Bhabha Atomic Research Centre (BARC), and Atomic Energy Regulatory Board (AERB) and International Atomic Energy Agency (IAEA) swung into action to review the situation of Indian NPPs. In this regard, an international workshop on Ã”Ã‡Â£External Flooding Hazards at Nuclear Power Plant SitesÃ”Ã‡Ã˜ was also jointly organized by AERB, NPCIL, IAEA from August 29 to September 2, 2005 at Kalpakkam, Tamil Nadu, India. In short, in can be inferred that Nuclear Authority in India took their first lesson from December 26, 2004 tsunami itself. In case of NPPs in Japan, March 11, 2011 earthquake and tsunami is not the first warning by nature. In fact, July 16, 2007 earthquake KK (Kashiwazaki Kariwa, largest NPP site) was hit by a near-field earthquake of magnitude 6.6, which generated earthquake ground motion beyond their design basis, however, reactors shutdown safely, with some damage to safety and non-safety structures, equipment and components. The March 11, 2011 Japan earthquake and tsunami reaffirm further that strengthening of nuclear safety in India is must as NPPs in India are also not designed for such a tsunami height of more than 10 meters. Occurrence of event beyond-design-basis is now a reality. As far as, design is concerned, only two units at Tarapur (TAPS-1 &2) are BWR (boiling water reactors) and rest are PHWR (pressurized heavy water reactors). The PHWRs are well known for their active and passive safety features, though they are less efficient in terms of power generation efficiency. It may be noted that all Indian NPPs sites have their Onsite and Offsite plans well in place and regular on-site and offsite drills are conducted regularly. However, I would like to reiterate that in view of the March 11, 2011 Japan earthquake and Tsunami, there is an urgent need to reassess the safety of all the Indian nuclear facilities by an independent external group of experts, in true spirit of Ã”Ã‡Â£SAFETY- FIRSTÃ”Ã‡Ã˜ and Ã”Ã‡Â£DEFENCEÃ”Ã‡Ã´IN-DEPTHÃ”Ã‡Ã˜. Authors is ex-deputy Chief Engineer, Stress Analysis & Seismology, NPCIL, Mumbai and worked for almost 15 years in the area of site-selection, seismic design, seismic instrumentation and earthquake monitoring of all NPP sites in India. He is an ex-member of AERB Expert Committee on Seismic Qualification (ECSQ) of Nuclear Facilities; Executive Member, Indian Society of Earthquake Technology (ISET); Fellow, Geological Society of India; member - Indian Nuclear Society (INS), Seismological Society of America (SSA);and Associate Member, Earthquake Engineering Research Institute (EERI), USA. He has authored more than 40 research papers and has Two Research Award and one Pen Ultimate Reward to his credit. To all humble people of India, politicians, nuclear scientists, structural engineers, nuclear safety design thinkers and other think tanks, my request is to see following aspect. Japanese people have strong character, you can see no chest beaters even after so much they have gone through, they are watching silently (what? the action TEPCO and or the Government taking). Japan is an economic power and donor to many Indian infrastructure and development program. They can afford to pump money like sea water to handle such crises. Can India even think of such swift action, without chest beaters? India will not find money to take care of crises because all the money must be floating in Swiss banks. Japanese have edge in technology and they can achieve anything even after such a crises and come with high head, because the country citizen are with government. Their methods of handling situations are far more superior than we can even think of. Remember most of the Management or benchmarking terms comes from Japan only (Kaizen, Toyota Production System, Kanban, 3 forms of waste (muda, mura, muri ), 3 Japanese words to guide decision making (Gemba, Gembutsu, Genjitsu), the 5S's (A program of 'industrial housekeeping' - seiri, seiton, seiso, seiketsu, shitsuke ). Whole world recognizes them and use them to improve their benchmark. We have to understand here that the country, which had faced effect of two nuclear bomb in 1945 had gone ahead to depend on nuclear power. The share of dependency on nuclear power is approximately 30% and in terms of power generation it is world number 3 ( generating capacity - 43,692 MW) after USA and France and considering the size of the country the dependency on nuclear power probably would rank it number one as it is nearly half the size of France (which has installed capacity of 61,443 MW). Japan does not produce nuclear fuel. It is ironical that the number 2 nuclear fuel producer in the world (Australia with share of 23% approximately) does not have a single operational nuclear power plant. The word "Tsunami" itself suggest that Japanese were the first one to see, name it and give description (to all of us). They are the one who feel earthquake everyday (being on the Ring of the Fire). Ten percent of the world's active volcanoes are found in Japan, which lies in a zone of extreme crucial instability. They are formed by subduction of the Pacific Plate and the Philippine Sea Plate. As many as 1,500 earthquakes are recorded yearly, and magnitudes of four to six on the Richter scale are not uncommon. Knowing so much vulnerability with country landscape, the Japanese, with such strong characteristics and bench marking with each process could have never compromised with the safety standards. Their safety standards are always much higher than we know or we can even understand. We can only bring shame in such an event, we had witnessed recently in case of Common Wealth Games. This happened when (we think) we have so much skilled manpower, technology and what not. What should we leave for our coming generations, has been debated and will continue to be debated till we make up our mind like Australia. Please learn from them and simply say NO to nuclear power. We may see budget requirement for nuclear power plant, operation, safety, waste disposal, decommissioning after plant life, preparedness and if any incident occurs would be certainly more than what we may invest in renewable power. Renewable Power has started showing trend of being economical, mass scale production and continued research is going to make it cheaper and affordable. Embrace Renewable Power and say NO to nuclear power. PLEASE reconsider your decision. does indian nuclear plants are safe? if so why there is lot of tense when Govt want to set up nuclear plant in konkan coast? does india is not suitable for alternative energy sources..
i posting due to my ignorance in this field and i welcome your replies.. Wonderful post indeed. With lot of technical details and analysis. Thanks to S. A. , Mr Agarwal and contributors. I wish to be part of discussion with answering few queries of Mr Rao. ==> As per measure taken by any Govt agency or serve, People of Konkan/India don't reply on it (May be they r feared by Japan Nuclear crisis). Morever, Govt is not giving any alternative to fishermen in nearby area. 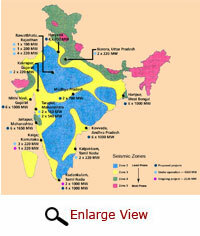 I believe why GOvt of India don't see renewable energy sources like wind , solar, tide, bio-mass in same region. Konkan is great place for tide, hydro-electric energy. Refer Tata hydro-electric plants in areas around Sahyadri mountains. Bhura power plant near Mulashi, Pune is good example. ==> Govt is not giving any alternative to fishermen in nearby area. May be political intervention could be some of cause to flame the fight. ==> Exactly, my point is same. Why Govt don't help to initiate another 10 hydro, solar, wind, tide energy generation plants. Indian will love to see it then allowing some French company Avera to try out some latest nuclear reactor! Avera have many other renewable energy projects too. Why Govt see to bring something destructive here. ==> I was standing right there in Mumbai Gateway of India to support Anna Hazare to pass the bill on Jan-Lokpal. Its all up to you to go and support. Even supporting via online ad is good idea ! Having gone through the observation about the vulnerability of nuclear power plants to disaster particularly to the Nature and mankind, I have decided to file / writ petition - Public interest litigation and obtain STAY ORDERS from High court / Supreme Court of LAW giving proper justification. May kindly advise in this regard with valuable inputs to proceed. Awaiting favorably at the earliest. Very important and timely comments till May 2011. Hope discussions are still open as there are no guidesto the contrary. The nuclear issue is part of larger dynamics- fast changing, of generically corrupted modern civilization. Modern civilization's designs of various machines and systems do not take into account these cumulative effects which are resulting in man-made disasters. The specialisations by definition consider the apparently separate existences in nature as true and non-interacting with one another to any significant degree. This is illustrated well by the discussions so far. The truth is the entities in nature are rigidly interconnected and really inseparable. Nuclear plants including many times more radioactive "spent fuel pools" and mining and milling tailings wastes have billion year radioactive hazards and must be isolated from nature but impossible to do so. The reactors and spent fuel pools are in a constant state of meltdown and impossible to prevent interactions with nature which are unacceptable for living in health here and now of living beings and their progeny. Any other type of energy converter is harmless when a great earthquake jolts it directly underneath. But vast areas will be rendered uninhabitable for all time till the next day of Brahma,4.32 billion years later when a nuclear there explodes. It is only a matter of luck that operative vintage design reactors and spent fuel pools are still operating. But no longer. The cumulative effects of a large number of systems of modern civilization make these reactors totally unacceptable and by extension, no man made reactor system will be. Thus as nature intended the only safe place for nuclear reactions is the sun. The vast number of base load stations of coal and nukes have made it mandatory to have enormous capacity of hydro stations all over the world if the gargantuan needs of modern civilization are to be met whether safe or not. These are causing earthquakes worldwide and climate change. This is causing extremes of rainfall showing up a cumulative effect of dams in making themselves unable to store these surges of water inflows and flash floods,being beyond their designed limits. Thus the positive feedback of the cumulative effects of modern civilization is destroying modern civilization. This Mahatma Gandhi,well versed in the characteristics of normal civilization, revealed way back in 1908 when,seeing the dramatic flu pandemic because of the dams and the horrible effects like population explosion due to deforestation and imperialist brutality in converting our decentralized ways to central dictatorship and wicked specialisations remarked: Given enough time modern civilization will destroy itself. Thus unless we recognize the truth that everything is interconnected in nature and practice return to nature of all we took, we will be poisoning every single web of nature with man-made poisons from radioactivity leading us to extinction. Close down modern civilization and nukes and go normal. Now is the time to accept the absolute inadmissibility of human fallibility in modern civilization and turn to harmony with nature. Waste streams 1. During operation, nuclear power plants routinely release small amounts of radioactive isotopes. They affect humans.There have been several epidemiological studies that claim to demonstrate increased risk of various diseases, especially cancers, kidney failure and lungs not working properly among people who live near nuclear facilities. 2. Around 20–30 tonnes of high-level waste are produced per month per nuclear reactor. How does the government propose to dispose the highe level nuclear power plant waste? Why even build nuclear plants when there are alternates out there? Why even risk vast majority of india for thousand of years by building these stupid reactors? Its like putting radioactive bombs in every room of your house when it is very easy for our neighbor or enemy to explode it at their will. In last sixty years there are 5 wars with neighbors, and countless attacks by terrorists, so who cares about earthquakes and tsunami balonies? Be smart for coming generation for thousands of years if not for yourself. The nuclear power plants don't produce High level waste. the produce intermediate level wastes (spent fuel) in small quantities. The High level wastes are produced in small quantities in reprocessing plants which reprocess spent fuel. It is clear from the article and the comments on it that Nuclear Power Plants in India are vulnerable for disasters with damage to people, their properties and environment. This is in general and more severe when the N Plans are situated along the Coast. Knowing the challenges and vulnerabilities associated with N Plants, it is advisable to look for strengthening the alternatives. The power generation based on Lignite and coal have got problems at both the stage of mining and generation. The challenges and vulnerabilities due to Nuclear and Thermal Power generation have been raised by the people who are going to be affected with long term consequences on both people and environment. Then comes the question of alternatives available? Yes, we have got alternatives like: hydro based power, wind based power, and gas based power. In spite of its best use, still there exists significant gap between the demand and availability. Though the concept of solar based power generation is well established and used insignificantly. Some of the models like solar lamps, solar cookers, solar driers, solar heaters, solar pumps, solar inverters, solar AC, solar vehicles are in use with limited use. Knowing the potentiality and advantages of solar based power generation, the policy makers should concentrate on its implementation with cost effective models / products with subsidy / incentives to the users / producers respectively. Support should be extended to the industries to come out with adaptable products matching to the needs of the people in general and particularly in the rural villages. Solar based power generation is friendly for the people and environment with sustainability as the potential of the source is beyond our imagination and only insignificant part of it will be used by all of us both for essentials and luxuries. You ask: "But, in 1990, how many of us had heard about the word 'tsunami'?" A lot of us did. The people who design and build nuclear reactors are not masons or low-end civil contractors but specialists. Indian Nuclear plants are the most hazardous sources of Electrical power.Infact nuclear plants were originally started to produce the fuel needed to make Bombs to be kept as prestigious products to gain one-penmanship among the political rival groups of USA and Russia who were fighting a cold war for world leadership and they used the cloak of power needs for civilian use.Even several Nobel Laureates condemned nuclear power and wanted alternate sources of Energy. In the wake of nuclear disasters,there is a thinking on small nuclear power reactors. Ã”Ã‡Ã³	Ã”Ã‡Â£There is revival of interest in small and simpler units for generating electricity from nuclear power, and for process heat. Ã”Ã‡Ã³	This interest in small and medium nuclear power reactors is driven both by a desire to reduce the impact of capital costs and to provide power away from large grid systems. Ã”Ã‡Ã³	The technologies involved are very diverse. As nuclear power generation has become established since the 1950s, the size of reactor units has grown from 60 MWe to more than 1600 MWe, with corresponding economies of scale in operation. At the same time there have been many hundreds of smaller power reactors built for naval use (up to 190 MW thermal) and as neutron sourcesa, yielding enormous expertise in the engineering of small units. The International Atomic Energy Agency (IAEA) defines 'small' as under 300 MWe, and up to about 700 MWe as 'medium' Ã”Ã‡Ã´ including many operational units from 20th century. Together they are now referred to by IAEA as small and medium reactors (SMRs). However, 'SMR' is used more commonly as acronym for Small Modular Reactors. Today, due partly to the high capital cost of large power reactors generating electricity via the steam cycle and partly to the need to service small electricity grids under about 4 GWe,b there is a move to develop smaller units. These may be built independently or as modules in a larger complex, with capacity added incrementally as required (see section below on Modular construction using small reactor units). Economies of scale are provided by the numbers produced. There are also moves to develop small units for remote sites. Small units are seen as a much more manageable investment than big ones whose cost rivals the capitalization of the utilities concerned. Already operating in a remote corner of Siberia are four small units at the Bilibino co-generation plant. These four 62 MWt (thermal) units are an unusual graphite-moderated boiling water design with water/steam channels through the moderator. They produce steam for district heating and 11 MWe (net) electricity each. They have performed well since 1976, much more cheaply than fossil fuel alternatives in the Arctic regionit is salutary to keep in mind the words of the main US pioneer in nuclear reactor development. Admiral Hyman Rickover in 1953 - about the time his first test reactor in USA started up - made some comments about "academic paper-reactors" vs. real reactors. "An academic reactor or reactor plant almost always has the following basic characteristics: (1) It is simple. (2) It is small. (3) It is cheap. (4) It is light. (5) It can be built very quickly. (6) It is very flexible in purpose. (7) Very little development will be required. It will use off-the-shelf components. (8) The reactor is in the study phase. It is not being built now. "The tools of the academic designer are a piece of paper and a pencil with an eraser. If a mistake is made, it can always be erased and changed. If the practical-reactor designer errs, he wears the mistake around his neck; it cannot be erased. Everyone sees it. The academic-reactor designer is a dilettante. ......." . (Source: Small Nuclear Power Reactors,World Nuclear Association). Countries which have nuclear reactors experience heavy difficulties in disposing of their nuclear waste. News of ships roaming the oceans flying the flags of the countries or obscure flags for that matter is not news to the world. No sensible port in this world will allow them to even for refueling or for replenishing stores. They are like the ghost ship in the Ã”Ã‡Ã¿Rime Of The Ancient MarinerÃ”Ã‡Ã–, every harbour forbidden to their berthing. We will wonder who would enlist willingly for working in these ships. Perhaps they might be being manned by the death-row prisoners of those countries, forcefully recruited clandestinely. Why canÃ”Ã‡Ã–t these countries which are skilled enough to design, install and run a nuclear power plant unable to process and dispose their waste in their own countries? They themselves know well the ghosts of these deadly materials used and dead will come back to their people. Spent fuel is the main waste of a nuclear reactor which is a cocktail of plutonium, strontium and caesium, all deadly. Exposure to them for 15 minutes at a distance of 30 feet will leave a person dead. Countries like USA store them in the original form of spent nuclear rods in 1 meter concrete-covered, double-walled stainless-steel tanks, immersed in deep water reservoirs, and cooled continuously at very low temperatures for 50 years, which is temporary storing. Someday, when science becomes able and equipped enough to find a permanent solution to store them safely for a thousand years, they will remove these deadly canisters from temporary storing to a more permanent kind of storing. In Britain they keep it in the molten form inside concrete-covered steel tanks, water-cooled without stop. In France they mix it with silica and boron and heat to 1500 degrees of centigrade, almost making it glass which is them stored in concrete-surrounded steel containers, cooled down continuously and stored temporarily, always fearing when they would corrode away and leak. A 2000 megawatt nuclear reactor will produce 30 such canisters each year and one can imagine what a vast and enormous kind of deadly arsenal the nuclear countries of the world is storing away for the coming generations of a thousand years. 50 yearsÃ”Ã‡Ã– satisfaction and pleasure for an abundance of electrical energy for the presently living generation, and a 1000 yearsÃ”Ã‡Ã– agony and calamity for the coming unborn generations. Are we blind brutes to utilize a power source without being able to dispose of its byproducts safely and permanently? When construction of a nuclear plant begins, protests also begin where there are sensible people. Due to several reasons, the people in Tamilnadu who are fighting against the Koodankulam nuclear power plant cannot fight as effectively as the anti-corruption agitators in New Delhi. Fighting against corruption is not as deadly as fighting against international power managers. They have far greater resources than governments. Even governments have to adjust their nuclear policies to suit them which we have seen manifested in the two-mindedness in India whether to allow or not the Russians to escape from the liability of any future nuclear accidents. In the Bhopal genocide, the law courts, union government, parliamentarians and the bureaucracy of India could do nothing, in spite of all the laws they created during the 65 years after independence. The companies won everywhere, in India and abroad. If a nuclear holocaust occurs, then again this is exactly what is going to happen. Every Indian citizen knows this but like Cinderella, we are unable to disentangle the hoary old man seated on our shoulder. It is the world business and industrial magnatesÃ”Ã‡Ã– decisions that rulers present before their people as the countryÃ”Ã‡Ã–s policies. Anti-corruption agitation has supporters everywhere bur for fear of antagonizing international energy cartels, the intelligentsia of India does not support the anti-nuclear agitation. Fighting against corruption is fashion but fighting against nuclear reactor is death and disaster. Anti-corruption fighters were not alleged to have been waging war against the country or were not forcibly tested for insanity as it was done by the Tamilnadu government. Anti-corruption agitators were not alleged to have been inspired by any enemies of India but Koodankulam agitators were alleged by the government to be funded and motivated by foreign powers. Government does not have to answer to anyone for the anti-corruption agitation going on intensely in the country but it does have to answer to a few foreign powers why peoplesÃ”Ã‡Ã– agitation is going on uncontrolled against nuclear power plants. Who are our real masters and owners now? Koodankulam agitators may fail or they may win after a nuclear holocaust as the one that happened in Russia, the builders of this reactor occurs. But they have quiet effectively proved that their allegiance is to the people of India, not to foreign powers. Their agitation was and is a prick on the conscience of India. India has never been an advanced country in the matter of designing and running nuclear reactors and producing nuclear fuel like Germany, USA, Japan, England and Russia. Three-Mile Island, Fukushima and Chernobyl disasters proved beyond doubt to the world that advanced nuclear countries are prone to reactor disasters. India and Russia are nowhere near building a fail-proof atomic reactor. KNPP was actually a gift and Indians have the habit of drinking even poison if got free. After knowing much on both the sides of establishing the Nuclear Plants, certainly it gives sufficient information for the decision makers to act. Establishment of the Nuclear Plants should be seen in terms of vulnerability to natural disasters, alternative livelihoods for the Project Affected People (PAPs), impact on the health & wealth of the People & Environment, and cost benefit analysis. When SOLAR ENERGY is abundant, freely available, can be generated where it is required, minimum loss at transmission, low maintenance cost, and certainly acceptable by all, why the focus is less compare to non-renewable sources like thermal and nuclear. To resolve most of the objections raised by the common people, professionals and experts, it is better to utilize our time, energy & resources towards the non-conventional source of energies. In India whether NDA or UPA, they are least bothered on the afety of the country or people. Their sole objective is to subserve the Western interests. You, Dr. Manmohan Singh as an economist, during his first stint as PM vehemently opposed FDI but as PM in his second stint supported FDI with US President's order. Before Independence we were subserving the British rulers and nowwe are subserving the USA rulers. US wanted to accept what ever MNCs wanted by our rulers if not we will be punishable. For FDI, our government already devalued Indian rupee against US$. We are not worried how it is going to effect common man in India. With FDI the Western MNCs dump in India all rotten goods. We happily accept them. They bring GM food without lable and make Indians eat like Guinea pigs. In this connection, at least educated must come together and fight to make India safe and secure at the onslaught bt Western MNCs under guidance of World Bank. The Madras Atomic Power Station in Kalpakkam, Tamilnadu has two Pressurized Heavy Water Reactor Units 170 MW capacities each which use Uranium as fuel and Heavy Water as coolant and moderator. Ultrasonic methods are used for remote-inspection of coolant channels to assess their metal integrity. This is undertaken during regular maintenance works after shutting down the units. The reactor vessel calandria will have calandria tubes which carry inside them heavy water at 70â”¬â–‘ C. The attached 306 numbers of coolant tubes placed inside the calandria tubes will have heavy water flowing through them at 295â”¬â–‘ C. Vibrations of the heavy water flowing through calandria tubes will gradually move the garter springs in the end-fittings, resulting in sagging of coolant tubes. Once both tubes come to proximity or even make contact which cannot be helped, the temperature difference will suddenly lower the coolant tube temperature from 295â”¬â–‘ C. The zircaloy-made coolant tubes, under the sudden chilling effect, will produce zirconium hydride, become brittle and develop micro-cracks, the dread of all atomic engineers. Even though metallurgical innovations are there, who in India will care to replace these costly tubes regularly? In time, the coolant flowing through them, which is radioactive heavy water, will begin to come out through these micro-cracks. Such Loss Of Coolant Accidents are common in India which lead to reactor fires or radiation pollution to employees and local people. Even after the Bhabha Atomic Research Centre carrying out sagging examinations of the end fittings of coolant tubes and the coolant tubes now being begun to be made of zirconium niobium instead of zircaloy, Loss Of Coolant Accidents have not totally stopped in India. Seal Plug examinations during maintenance are supposed to tell where a seal plug is not seated properly. On March 26, 1999, the automatic control system in MAPS noted that a seal plug was out of position, after a significant quantity of radioactive tritium had leaked. The plant authorities tried to deny tritium release but none other than the former chairman of the Atomic Energy Regulatory Board, himself a close watcher of nuclear safety standards, assessed the quantity of the leak to be several tonnes, probably near 14 tonnes of heavy water released into the plant, which alone would justify declaration of a plant emergency within three minutes as was done then. In his assessment, Ã”Ã‡Ã¿a very large amount must have gone into the drain and spread out, and the tritium release must have also been sucked into the ventilation system.Ã”Ã‡Ã– This release of a lot of radioactivity was Ã”Ã‡Ã¿an insignificant leak, well within AERB limitsÃ”Ã‡Ã–, according to the director of operations of the National Power Corporation. If the primary coolant tube ruptures, coolant heavy water would come out. If instead the secondary calandria tube ruptures, it would be the moderator heavy water that would come out. Authorities liked to think that it was the primary.